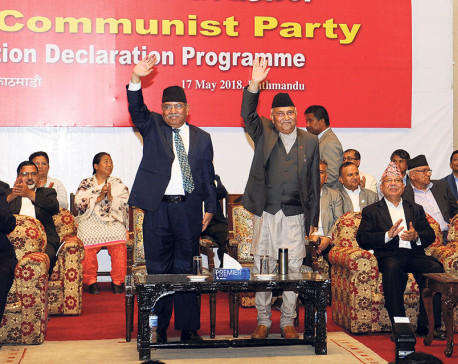 KATHMANDU, May 24: The newly-formed Nepal Communist Party (NCP) has formally given full shape to its central committee and administered the oath of office and secrecy of leaders inducted in the party's apex committee. As many as 150 members, who were appointed under quotas for the erstwhile UML and the Maoist Center in the aftermath of the merger, were sworn in amid a function organized at prime minister's residence in the capital on Thursday. The new appointees were administered the oath of office and secrecy by NPC chairs duo Prime Minister KP Oli and Pushpa Kamal Dahal. The party also passed a minute with signatures of all the CC members in order to proceed with the remaining works of party registration with the Election Commission.NCP leader Pampha Bhusal said that Thursday's meeting was a plenum of the CC meeting that convened before the announcement of the new party. In addition to 441 members, the newly-formed party has appointed six leaders including Amik Sherchan, Amrit Bohara, Keshav Badal, Pushpa Raj Kandel, Peshal Khatiwada and Somnath Adhikari as invitee members of the central committee. All the cabinet ministers and state ministers in Oli's government and chief ministers of six provinces led by the NCP have been inducted in the CC. 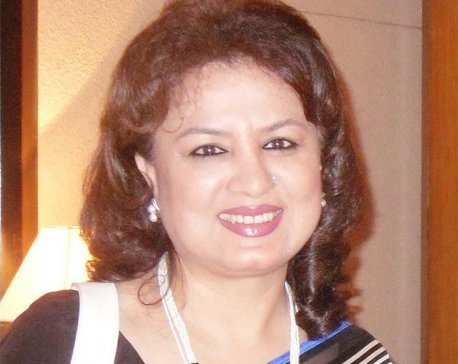 After party general secretary Bishnu Paudel unveiled the complete list of the CC on Tuesday, both party leaders and outsiders have taken a strong exception to the poor representation of women in the top body. Only 73 members in the 447-strong committee are women. The party leadership has also come under severe criticism for failing to give space to the leaders representing backward and marginalized communities.NCP chairs duo KP Oli and Pushpa Kamal Dahal on Thursday directed the central committee members to take the message of party unity down to the grassroots.